I feel like a lot has happened since I last blogged! 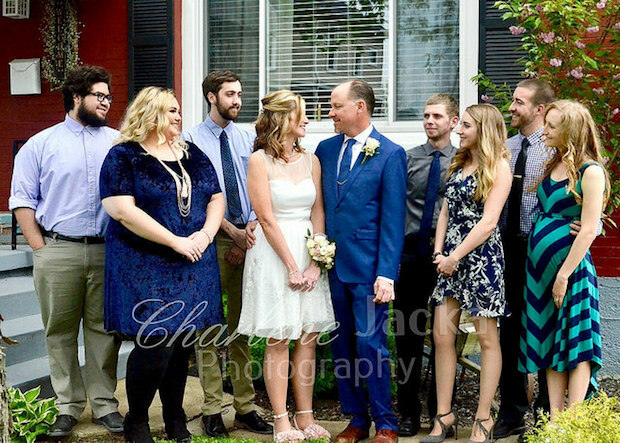 First of all, my father-in-law’s wedding was great! 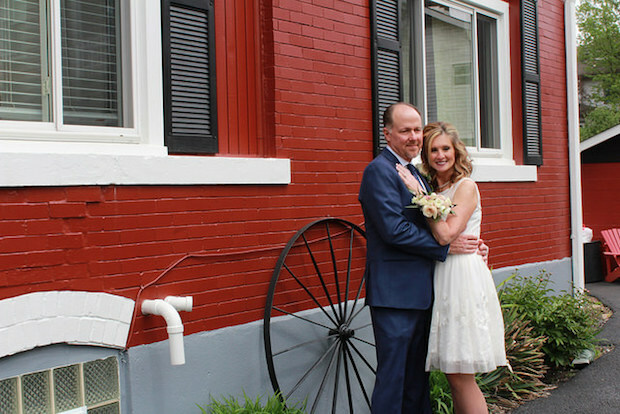 Fred and Kim tied the knot in a small, intimate ceremony with family and it was beautiful. Jimmy and I are so incredibly happy for them! I am happy to report that the cake and cupcakes turned out well and were enjoyed by all! 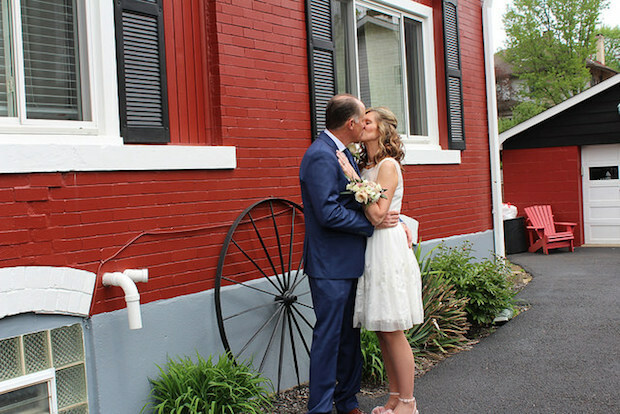 I started all the preparations on Thursday morning and hardly thought about anything else until the wedding was over on Saturday night. 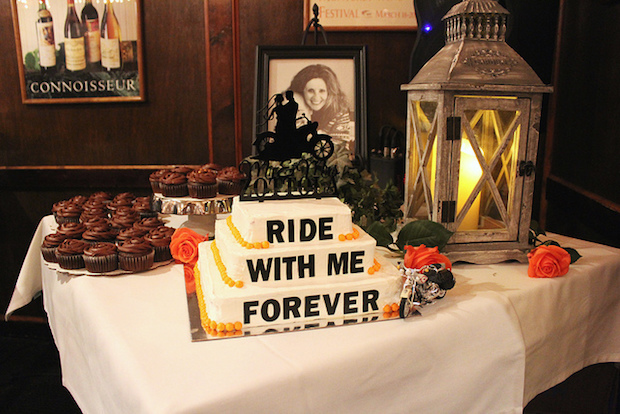 It was definitely an intense few days, but so worth it to see the happy couple enjoy their Harley Davidson-themed cake! If anyone is interested, I can do a separate post on the cake and cupcake details. Other things of note include how incredibly blessed and thankful I have been feeling lately. Do you guys know P from Will Study For Food? If not, I’d recommend checking out her blog. She makes me want to live in California and is totally rocking the whole PhD thing! 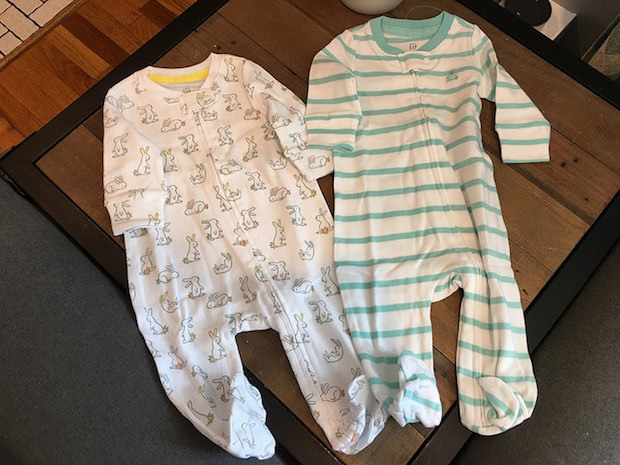 P sent me the sweetest package of baby clothes last week. Thank you so, so much, P! Jimmy and I absolutely love the little sleepers and were ohhing and ahhing over how cute they are. Also, my mom and sister both gave me early Mother’s Day gifts, which was so unexpected and thoughtful. Hannah gave me a few adorable mom-themed Origami Owl charms for my locket and my mom gave me the Magnolia Table cookbook and a mom mug! Lastly, I mentioned in the post before this that Jimmy and I had our anatomy scan last week. We are so excited to share that baby is healthy and doing great! We also found out baby’s gender, which I will share in my next post. Maybe I’ll do a little pregnancy update since we’ve hit the halfway point?! Long story short: we are feeling blessed, loved, and excited! God is good. And you know that I’d love to see a cupcake and cake post. 😉 The cake looks INCREDIBLE!!! Awesome job. I’m sure it was delicious too! Thank you for letting me know about your blog being private! I requested an invite! Also, thank you for the compliments on the cake and cupcakes! It was crazy and fun and satisfying to take on my first wedding cake! I will definitely do a post on the details! The anatomy scan went well! What a blessing! It truly is an exciting time! The cake looks amazing Allie! I’m so jealous you got the Magnolia cookbook – it’s on my birthday wish list and would love a review once you make a few recipes. Can’t wait to see the gender of your baby. Thank you so much, Maureen! It was a lot of work, but worth it to see their faces and have everyone enjoy it! I will definitely let you know how the Magnolia cookbook is! I just finished reading their book The Magnolia Story and it was so cute! I’m super excited for the anatomy scan post. I saw the little outfits but they are so gender neutral :). Glad your mom gave you a mother’s day gift and I love that coffee mug! How appropriate! I’m glad I got the anatomy scan post up! We were so excited for that! You’re right… The coffee mug is so appropriate LOL! The cake and cupcake looked amazing!! I know it was stressful, but you did it, and I’m sure both Fred and Kim were happy with the results!! I’m glad you like your Mother’s Day gifts – I know you’ve been wanting Jo’s cookbook since you heard she wrote it! I am so excited for you to post the anatomy results too — although I know the results — sorry everyone reading this… but being in suspense is fun, isn’t it?? Thank you, mom, for the compliments on the cake and cupcakes, and the amazing Mother’s Day gifts! It was so fun to be able to tell you and dad the anatomy scan results in person! I love you! Good job on the cake and cupcakes! I’m super excited for the gender reveal post. Most important, I’m glad you and baby are happy and healthy. Yay! 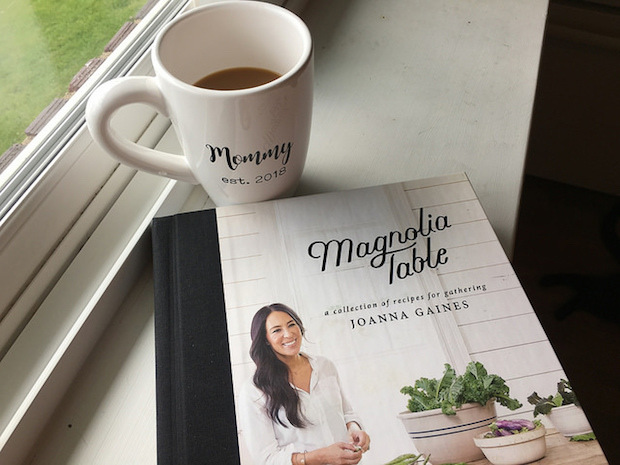 What do you think of the Magnolia Table cookbook? I think I want it. Thank you! The anatomy scan was so exciting! I think we are still on cloud nine about it! The cookbook is awesome! I’d recommend it! How did your mom like the race?! It was SO HOT!!!! I kept meaning to tell you they didn’t go! So sad! My mom ended up with a stress fracture in her femur. How did you like the race?! I need to catch up on your blog and read your post about it! Awww you got them! Yay 😀 ! 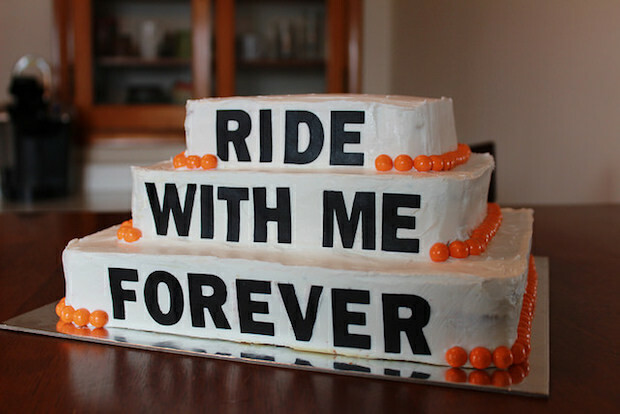 The wedding looks like it was so much fun, and your cake looks marvelous as usual! Thank you so much, P!! You totally made my day and now every time I look at those cute little sleepers I smile and think of you! I can’t wait to see her in them! Thanks for the compliment on my cake, too! That cake turned out so lovely! You really are quite talented. I can imagine that they all loved it. 🙂 Also, how sweet is it that you get to celebrate your first Mother’s Day this year? That is just precious to think about. You looked radiant in those wedding pictures! Thank you so much! It was amazing to celebrate my first Mother’s Day! Such a special time, and to think next year we will have her in our arms (Lord Willing!) at this time just has me giddy! I was 7 months pregnant on Mother’s Day last year and it was such a special sort of Mother’s Day filled with anticipation. Happy (early) Mother’s Day, my friend! You are going to be such a good mommy! Thank you for the compliments on the cake and cupcakes! I can’t wait to hear about your big baking session in July! Happy belated Mother’s Day to you! It was definitely neat anticipating the fact that on the next Mother’s Day, Lord willing, we will have baby girl in our arms! I now know how you felt last year!